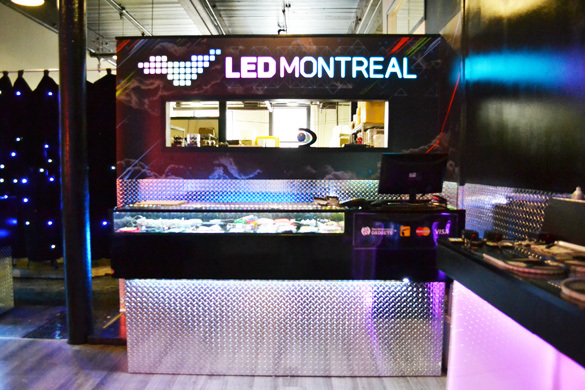 LED Montreal is also a store, come and visit our showroom! You can ask questions and see all the products displayed right before your eyes! The store is in Montreal’s St-Henri area, near Atwater Market. If you’re driving from the Downtown area and want to avoid highways, there are multiple roads to take, the simplest being going west on Sherbrooke st., Maisonneuve st. or Rene-Levesque st. From any of those 3, drive west to Atwater ave, then turn left on it. 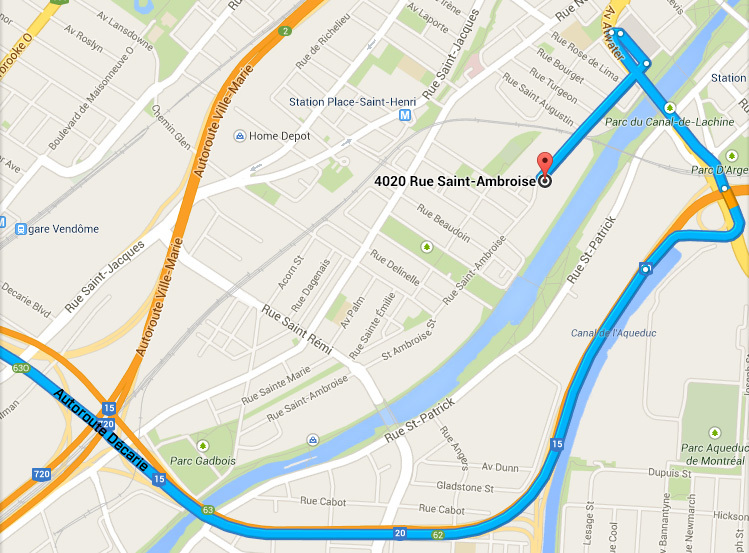 Go all the way down, past the Atwater Market then turn right on St-Ambroise street (see map). For parking instructions, see the parking section below. Driving on 720 highway west, take the exit toward Atwater avenue, merge onto St-Antoine street west and then turn left onto Atwater avenue. 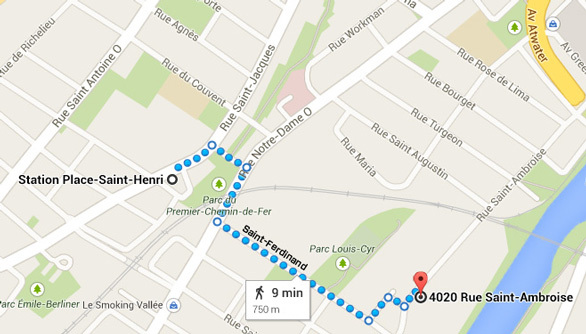 Go all the way down, past the Atwater Market then turn right on St-Ambroise street (see map). For parking instructions, see the parking section below. From the South Shore of Montreal / Longueuil / Brossard. Driving on Champlain Bridge, follow Autoroute 15 N / Autoroute 20 W to Atwater avenue, take the Atwater Ave exit. 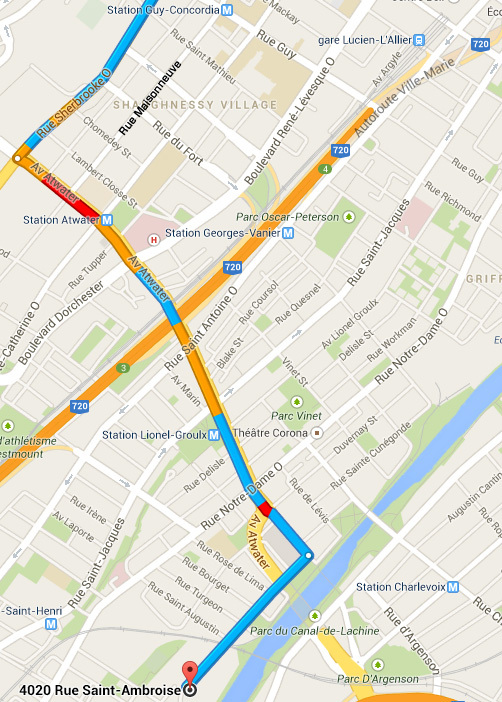 Merge onto Atwater avenue, then turn right onto Sainte Émilie street (becomes Greene ave). At the end of the street, turn right onto St-Ambroise street (see map). For parking instructions, see the parking section below. 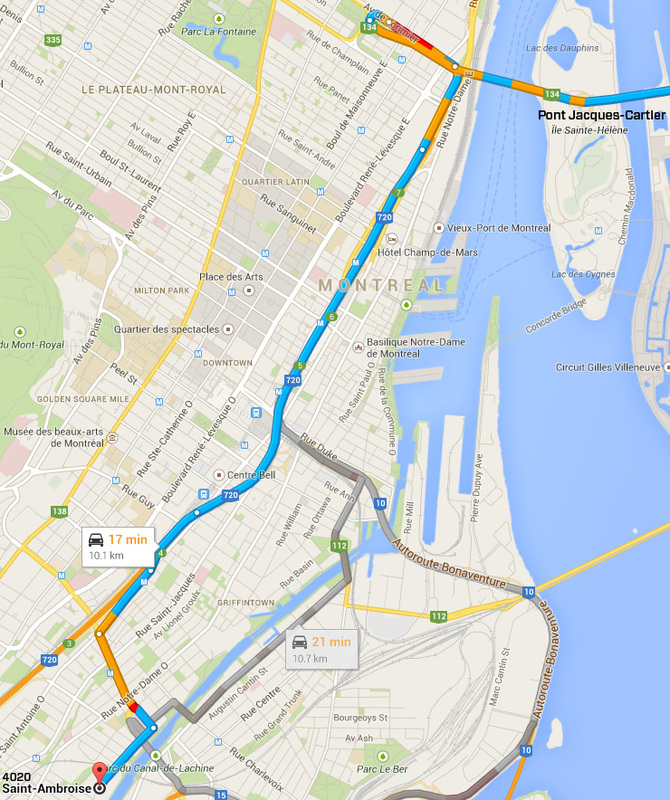 Driving on Jacques-Cartier Bridge toward the island of Montreal, follow the directions to get onto Highway 720 West / Downtown Montreal Centre-ville. Driving on 720 highway west, take the exit toward Atwater avenue, merge onto St-Antoine street west and then turn left onto Atwater avenue. 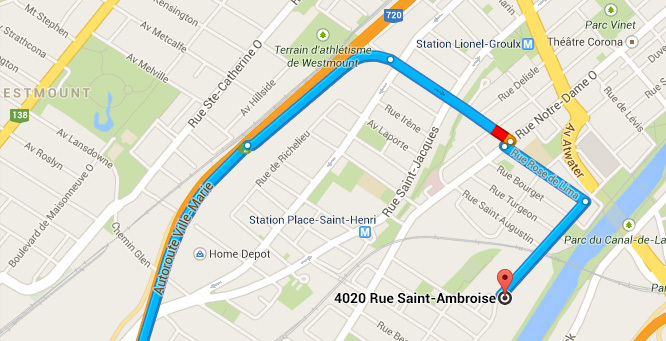 Go all the way down, past the Atwater Market then turn right on St-Ambroise street (see map). For parking instructions, see the parking section below. Driving on Highway 15 South, take exit 61 for Atwater ave. 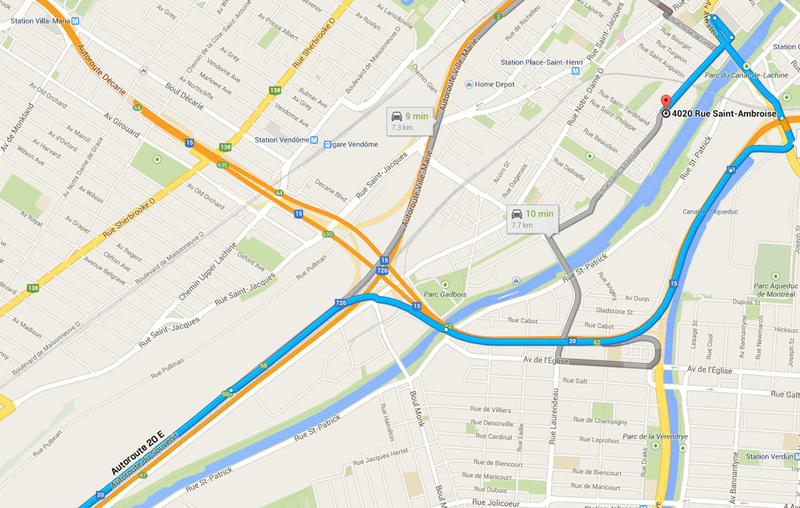 Merge onto Atwater ave, then turn right onto Sainte Émilie street (becomes Greene ave). At the end of the street, turn right onto St-Ambroise street (see map). For parking instructions, see the parking section below. From West of Montreal / Highway 20 East. Driving on Highway 20 east, take Exit 68s for Highway 20 E / Highway 15 S toward Highway 10 / Champlain Bridge / U.S.A. / Québec. Merge onto Highway 15 S / Highway 20 then take exit 61 for Atwater ave. 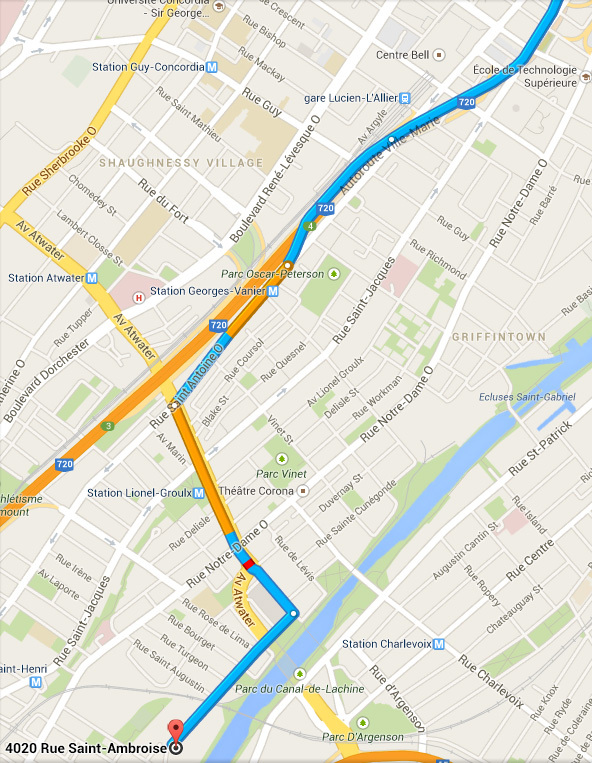 Merge onto Atwater ave, then turn right onto Sainte Émilie street (becomes Greene ave). At the end of the street, turn right onto St-Ambroise street (see map). For parking instructions, see the parking section below. Driving on Highway 720 east, take exit 2 toward Atwater avenue. Merge onto Rose de Lima street, then turn right onto Notre-Dame street West and turn left again to get back onto Rose de Lima street. Turn right onto St-Ambroise street (see map). For parking instructions, see the parking section below. Where do I find parking? 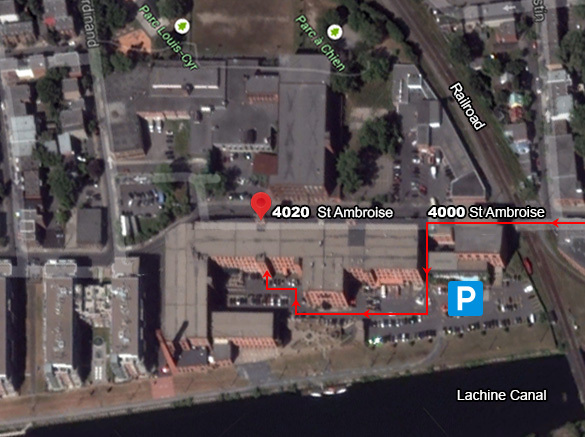 Once you get to the building (we’re located inside the Château St-Ambroise), you can park in the building’s back parking lot. It is free for the first 30 minutes and the entrance is on St-Ambroise street, next to the 4000 St-Ambroise door. If you require more than 30 minutes, there is plenty of street parking available nearby, just make sure you look for the parking signs to make sure parking is allowed where you are. I’m entering the building, how do I find your store? Our store is located at Suite #145. If you’re entering through the back parking door (not the loading docks), turn right and walk a little bit, you will find the store to your left very quickly. If you’re coming in from St-Ambroise street, make sure you use the 4020 door. Once inside, walk straight, pass the information desk and at the end, turn left. Walk for a few more seconds, you’ll pass the back parking door, keep walking and then you will find the store to your left. There are LED Montreal SIGNS everywhere on the building’s main floor, they give you clear directions on where to go! Follow them! Here you go, we're happy to welcome you to the store!